Australian actor and prolific author William McInnes, typifies so much of what is good about Australia, the straight-forward, community-minded Australia of his parents. 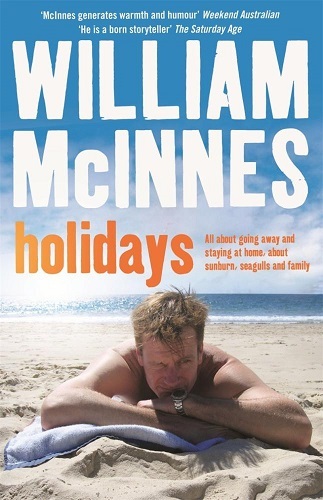 His latest book, Holidays, tells of his childhood at the moment of discovering what the word “holiday” actually represented – a time when suddenly a ride on the train to somewhere different was on offer, or when the neighbours suddenly disappeared for a period of time, leaving his family to look after their pet budgie. As he remembers his mother explaining to him, “Holidays is when you get to do lovely things you wouldn’t do otherwise.” It was to McInnes, the real point of Australians going to work in the first place. This memoir is a humour-filled reminiscence of his family holidays, with a real sense of nostalgia for the simple pleasures of his childhood. It is his celebration of being fortunate enough to be brought up by parents from a generation epitomising a less materialistic society without any sense of entitlement and with a genuine generosity of spirit. “They inevitably, because of the times in which they lived, had narrower horizons, but their values were anchored and deep”. A veteran actor in TV series such as Blue Heelers, SeaChange, The Shark Net, East West 101 and The Time of Our Lives, as well as appearing in Kath & Kim under the pseudonym of “Rock Hampton” (his old university), McInnes is modest about his achievements. Despite twice winning the award for “Most Outstanding Actor” at the Logies, McInnes is endearingly incapable of pretension. “I don’t think that I’m the greatest of actors but acting is something very temporal – you can’t take something so transient seriously.” It is this balanced view of life that resoundingly echoes in his writing, liberally laced with his infectious sense of humour. An admirer of strong women and supporter of women’s causes, McInnes is a much deeper thinker than his jovial exterior might suggest. He is also someone who has suffered the heartbreak and pain of losing his wife, gifted filmmaker and author Sarah Watt, to breast and bone cancer. His proudest achievement is the book they jointly wrote before her death, Worse Things Happen at Sea. *Prices accurate at time of publication and are subject to change by the retailers.